New players of the original Pokémon games, which celebrate their 20th anniversary this year, are given a difficult choice at the start of their adventure: do they choose Bulbasaur, Squirtle, or Charmander? The vast majority of Pokémon fans go for Charmander – an adorable dinosaur with a fiery tail, Charmander grows up to become Charizard, the fierce flying Pokémon that’s inspired by Western dragons. Yet in spite of its continued legacy as one of the most popular Pokémon in the franchise, Charizard and its earlier forms have plenty of secrets that casual fans of the franchise might not know. Here are 13 Things You Didn’t Know About Charizard. Charmander, the first Pokémon in Charizard’s family line, is iconic for the small flame that burns at the end of its tail. Its name – a portmanteau of ‘char’ and ‘salamander’ – clearly points to its origin: the popular understanding that salamander lizards are born and grow in fire. Hence, in reference to this legend, Charmander has a small fire burning at the end of its tail which remains through all of its evolutionary stages. While the belief that salamanders grow in fire was prevalent for centuries, however, modern science has determined that this is not the case: like all other lizards, salamanders are in no way impervious to fire. It’s believed that this legend first started when early humans observed salamanders scampering out of burning logs to avoid being roasted alive, and after this idea was perpetuated by Aristotle, most scientists took it as fact for centuries without investigating the origin of salamanders any further. In real life, any salamander with its tail on fire is probably not a happy lizard. Plenty of Pokémon have gone through slight aesthetic changes over the years. Some of these changes have been very small – such is the case with Charmander, who at some point in its time as a popular character lost a row of small spikes which originally ran down its back. This design change is believed to have happened as part of creating a more unified canon of designs for the Pokémon cartoon series – as such, the earlier original Pokémon manga depicts a very off-model Charmander with noticeable spikes on its back. What’s more, the original back sprite for Charmander in the Red and Blue Pokémon games features a line which is meant to indicate spikes, although, thanks to the confusing nature of many sprites in the early games, most fans fail to notice its inclusion. Creating synthesized Pokémon cries for the original video games was a difficult process – with only a limited sound chip to work from, many of these cries were fairly basic trills that were designed to sound vaguely like animal noises. While all cries within the game have different sound wavelengths, the noises that these waves produce are not always entirely distinct. Charizard’s cry from early Pokémon games sounds exactly the same as that of Rhyhorn’s to the human ear. In order to distinguish between the two, later Pokémon games feature a different cry for Charizard, however, the original cry is remixed and reused in the most recent games for Mega Charizard Y. 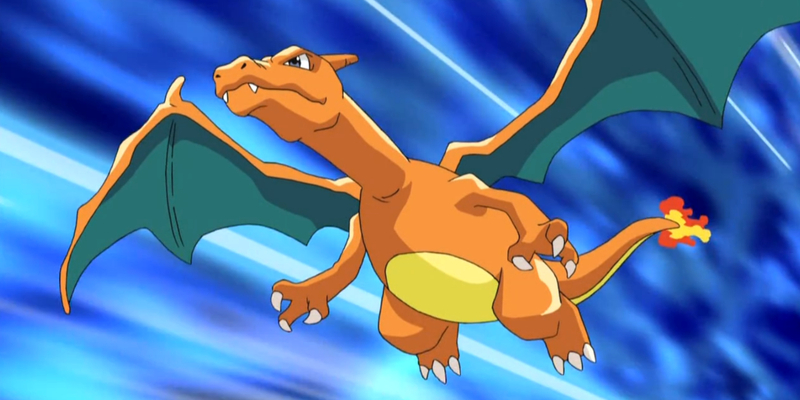 As Charmeleon evolves into Charizard, the Pokémon gains a large pair of leathery wings, as well as becoming part Flying type within the games. At various times across all media, Pokémon trainers are shown riding Charizards through the sky, and as far back as the original Pokémon Red and Blue, Charizard can use the move Fly to transport the player across to different towns throughout the game. That said, there’s a notable barrier to being able to perform this action: why Charizard is capable of using the move Fly in early games, it isn’t able to learn the move naturally. Only in Pokémon Yellow is Charizard capable of learning Fly, and as such, in order to get a flying Charizard in Red and Blue, players must trade their beloved dragon to a copy of Pokémon Yellow to teach it the move, before transferring it back. It’s believed that Yellow allows Charizard to learn Fly as a small connection between the game and the Pokémon television series, as Yellow features a range of tweaks to make the experience more familiar to fans of the cartoon show. Western fans of the Pokémon cartoon series remember the original cartoon’s opening credits – an electric guitar begins to wail as Mew and Mewtwo frolic in outer space, introducing viewers to the world of Pokémon. What many fans are unaware of, though, is the fact that the Japanese intro is very different. The beginning scene of Mew and Mewtwo actually comes in the middle of the title sequence, while the middle scene from the Western, showing Charizard, Blastoise and Venusaur, comes at the beginning. When creating the title sequence for the Western dub of the show, sections from the Japanese intro were reordered in order to fit with the music that had been composed for the show. What’s more, as the anime had been running for quite some time in Japan by the time an English language version was created, dynamic scenes of Pokémon battles had been animated in subsequent episodes and could by spliced in to create a more visually engaging intro sequence. Modern scientists are known for their enjoyment of various cartoons and video games, and when it comes time to name new discoveries, it’s not uncommon for those responsible for coming up with titles to draw from their interests and influences to make the naming process more fun. Such is the case with chilicola charizard, a species of bees that are native to Chile, which have been named after the popular fire-type Pokémon. Pokémon creator Satoshi Tajiri has spoken publicly about his inspiration for the series, citing his experiences as a child collecting bugs as the initial idea behind the Catch ‘Em All mentality in the Pokémon games. As Spencer K. Monckton, the scientist responsible for discovering chilicola charizard, is a devout Pokémon fan, this is a nice example of Tajiri’s childhood playtimes influencing genuine scientific discoveries. For those players who originally chose Charmander at the start of Pokémon Red or Blue, beating the first gym leader is an uphill struggle. Brock, the master of rock-type Pokémon, is challenging to beat in this case as Charmander doesn’t gain any moves which provide an advantage against rocks in the original games until much later. In what is generally believed to be an attempt to make this fight a lot more manageable, in the remakes of the original games, Pokémon FireRed and LeafGreen, Charmander can learn Metal Claw at a low level, meaning that players have a super effective steel-type move to use against Brock’s Onix. What’s interesting is that in subsequent games, Charmander cannot naturally learn Metal Claw at such a low level: because Charmander isn’t facing off against giant rock snakes, it doesn’t need the steel-type move. Big, aggressive and often disobedient, Charizard is one of the most popular characters in the Pokémon cartoon series. While Ash’s Charizard left the show years ago to live in a sanctuary for its species, it makes frequent returns to the show whenever is necessary for the plot. Ash’s Charizard is fairly unique among the wannabe trainer’s Pokémon – in battles, Charizard has displayed between seventeen and nineteen moves, depending on how they’re counted, which is more moves than any other single Pokémon has displayed. In fact, almost all moves that Charizard can learn in the games have been shown off in the cartoon series, a feat which hasn’t occurred for any other Pokémon. Fans of Pokémon will remember the episode "Snow Way Out," wherein Ash and his team are stranded on a mountainside during a blizzard. Ash uses the fire on Charmander’s tail to keep warm and avoid freezing – a decision which confused many fans during its original airing. By this point in the show, Charmander had already evolved into Charmeleon, and then Charizard, meaning that Ash no longer had a Charmander on his team. This continuity error is the result of a reshuffling of episodes as part of the American dub of the show. In the Japanese anime, the episode that Snow Way Out is based on occurs earlier in the series, before Charmander has evolved. A mix-up with the order of the episodes means that fans watching the English language cartoon will see Charizard inexplicable transform back into Charmander for a single episode. In order to make the Pokémon cartoon as enjoyable as possible, a wide range of voice actors have lent their talents to performing on behalf of the various Pokémon characters. While in some cases, the same actor has remained in the role for years, the rapidly evolving nature of other Pokémon means that multiple voice actors have been required for a single character. In the original series, Ash’s Charmander is voiced by actor Michael Haigney, who also voices a variety of other characters and Pokémon, including Psyduck and Koffing. When Charmander evolves into Charmeleon, voice actor Eric Stuart takes over – Stuart also provides the original voice for Brock and James, among others. Finally, Charizard shares its English voice actor with the Japanese show – Shinichiro Miki provides the voice for all three of Charmander’s forms in Japanese. Since its inception, the Super Smash Bros series of fighting games has paid tribute to Pokémon by including a variety of references to its most popular characters – some of these references are fairly subtle, while others are hard to miss. Charizard has appeared as one such reference in every Smash Bros game thus far, each time earning a larger role than in the game before. In the original Super Smash Bros, Charizard is an assist Pokémon which can be called upon by a player using a Pokéball item – there are thirteen such Pokémon that appear at random, with Charizard emerging from its Pokéball to use its flamethrower move on opponents. In Super Smash Bros Melee, Charizard returns as a Pokéball Pokémon, as well as appearing as a collectable trophy. In Super Smash Bros Brawl, Charizard joins Ivysaur and Squirtle as three interchangeable Pokémon which are used by the Pokémon Trainer character to do battle together, while for the fourth game in the series, Charizard appears as a full character in its own right. Genders are a relatively new addition to the Pokémon franchise as a whole. In the original games, only the Nidoran family tree has distinct genders, and while most Pokémon are given concrete genders in Pokémon Gold and Silver, there’s often little or no physical distinction between males and females within a species. Some new changes have been made to make genders clearer – for example, female Pikachu now have heart-shaped tails, but for much of the history of the Pokémon series it’s been difficult to tell a male create from a female. This being the case, it’s interesting to learn that the Pokémon anime has always gone out of its way to avoid referring to Ash’s Charizard by a particular gender. No gender-specific pronouns are used throughout the entire series – instead, the character is simply called its name whenever it is mentioned. One exception to this occurs in the English dub of the show, in the form of a single pronoun that is used once, but even this mention wasn’t in the original Japanese script for the show. Later in the show, Ash’s Charizard develops what appears to be a romantic relationship with a female Charizard at a sanctuary for their species. Some fans of the show have used this to suggest that Charizard is male, but this is hardly conclusive proof either way. The signature fire-type move for Charizards, Fire Blast appears as a huge wall of flames in a unique shape that blasts across a Pokémon battle to scorch its opponent. While other Pokémon use the move in the cartoon series, it’s most famously connected to the most popular fire-type. The symbol isn’t merely a random creation, though: it’s a joke which, on the whole, sails over the heads of audiences that aren’t familiar with Chinese writing. The shape is the Chinese character for ‘big’, indicating that when Charizard uses Fire Blast, the move creates a large wall of flames. As Japanese uses Chinese characters, this is a reference which the show’s intended audience understand well, while viewers in other countries generally don’t spot that Fire Blast’s shape is meant to be a descriptive of its significant power. There are few Pokémon which command the same level of respect as Charizard – while Pikachu might be popular and while Meowth might be cute, all fans of the Pokémon franchise know that the original fire starter is not to be messed with. What facts about Charizard are missing from this list? Which is your favorite Pokémon? Share your thoughts in the comments section below.